Below is part of an infographic that is doing the rounds at the moment. I have no way of knowing of all the facts and figures mentioned in it are correct. 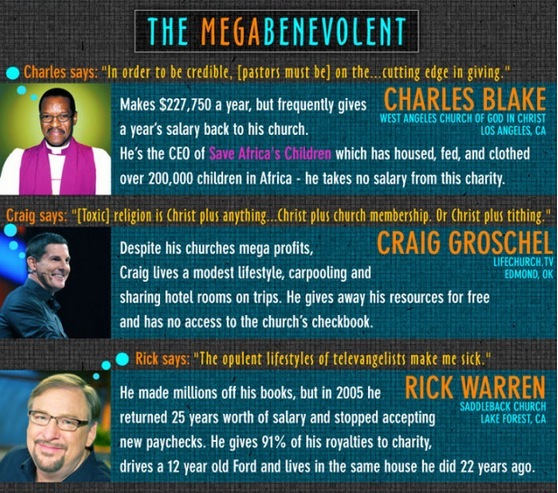 Certainly it doesn't show some Pastors in the most favourable light. But I think I will choose to focus on some great examples that seem to handle the "fame" and "fortune" in a great way. Not only does LifeChurch.TV give their resources away for free but they invest big time in youversion and the Bible App and give it away free.